While it may be tempting to feed domestic rabbits and guinea pigs a dry commercial pellet and forget about everything else, this type of diet is very harmful. If animals are housed exclusively inside with no access to grass or similar forage, all aspects of health will suffer. 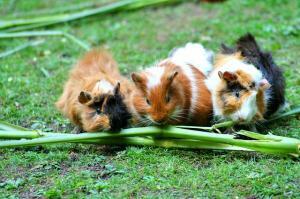 Whether housed inside or out, rabbits and guinea pigs must always have hay available to them. If they don't, one of the worst consequences is that their teeth overgrow and they can no longer eat. Rabbits that don't chew hay are also more prone to weight gain as their digestion is not being slowed down. While alfalfa is often recommended for small animals, too much of it (alfalfa-based hay or alfalfa-based pellets) can cause urinary crystals due to its high calcium content. Timothy hay is possibly the best type of hay for rabbits and guinea pigs as it is high in essential fibre, low in protein and calcium, and full of beneficial goodness for the gastrointestinal tract. Chinchillas and degus eat a similar diet, plus or minus a few things. For a start, chinchillas eat very small amounts. In the wild, they would've mainly eaten desert grasses and roots and so are ill-adapted to digesting high fat and high protein foods. They also have a hard time processing large amounts of green plants. Rabbits and guinea pigs may love vegetables, but chinchillas struggle to tolerate them, being very susceptible to diarrhoea. People tend to forget that chinchillas lived in dry places and so are dependent on a very dry diet. Degus have very similar dietary needs to chinchillas, being strict herbivores. They require large amounts of fibre in their diet and will often reingest their droppings to reabsorb the nutrients and maintain healthy gut function. It is important to remember that degus are highly intolerant to dietary sugar and can develop diabetes mellitus from consuming molasses, honey and glucose syrup. For this reason, it is well worth only feeding your pet treats intended for degus, as opposed to treats intended for other small animals. Avoid feeding your degu rabbit or chinchilla mixes as these often contain dried fruit pieces which are not suitable for regular consumption.